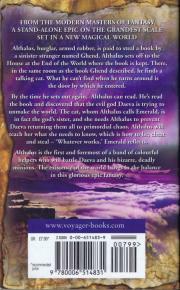 From the modern masters of fantasy, a stand-alone epic on the grandest scale set in a new magical world. Althalus, burglar, armed robber, is paid to steal a book by a sinister stranger named Ghend. 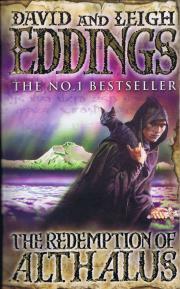 Althalus sets off to the House at the End of the World where the book is kept. There, in the same room as the book Ghend described, he finds a talking cat. What he can't find when he turns around is the door by which he entered. Byt the time he sets out again, Althalus can read. He's read the book and discovered that the evil god Daeva is trying to unmake the world. The cat, whome Althalus calls Emerald, is in fact the god's sister, and she needs Althalus to prevent Daeva returning them all to primordial chaos. Althalus will teach her what she needs to knowm which is how to lie, cheat and steal - 'Whatever works,' Emerald reflects. Althalus if the first and foremost of a band of colourful helpers who will battle Daeva and his bizarre, deadly minions. The existence of the world hangs in the balance in this glorious epic fantasy.